The Breitling Exospace B55 is equipped with just about any feature a consumer is looking for in a luxury timepiece. These features are tailored to suit the needs of pilots, but the watch is a perfect choice for anyone looking for a very precise and modern timepiece. The Exospace B55 is Bluetooth compatible and features smartphone pairing capability, allowing users to download results of certain measurements directly to their smartphones. The watch face has both an electronic and analog LCD display with luminescent hands and hour markers to ensure easy legibility. Additionally, the timepiece has a battery operated quartz movement with an end-of-life indicator that informs the user when the battery needs to be replaced. The prominent 46mm watch case is composed of black titanium with a matching volcano black dial, and comes on the classic black Breitling rubber strap. While the Exospace B55 was designed for the aviator, the Breitling Superocean Chronograph Steelfish is a true diver’s watch with a screw-down crown and case back that allows for 500m (1650ft) of water resistance. The timepiece features luminescent hands and markers against a black dial with white sub-dials and a rotating bezel. Unlike the battery-operated Exospace B55, the Superocean Chronograph Steelfish has the Breitling in-house Caliber 13 self-winding automatic movement with a 42-hour power reserve. True to its name, the Steelfish sports a large 44mm case and a bracelet made of brushed and polished stainless steel. This timepiece is equal parts functional and beautiful; it perfectly suits the user’s needs both at sea and on land. 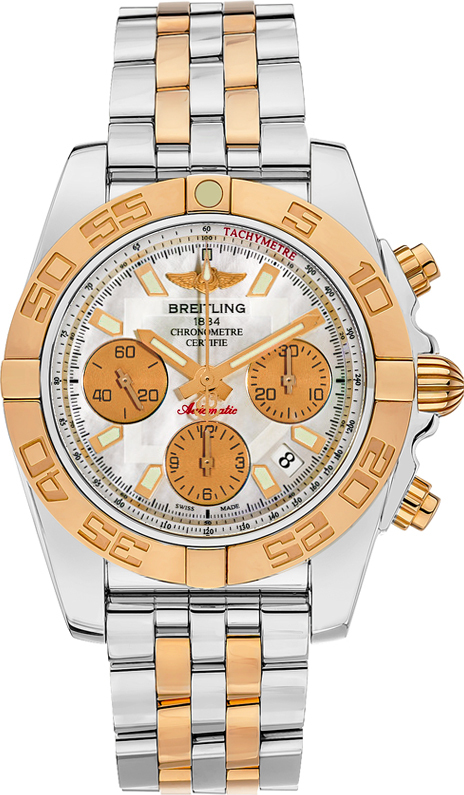 The Breitling Chronomat 41 is the epitome of a luxury timepiece. Composed of solid 18K rose gold and polished stainless steel, the timepiece features a white mother of pearl dial and three gold sub-dials. This timepiece is equipped with the Breitling Caliber 01 self-winding automatic chronometer movement with a 70-hour power reserve. The polished stainless steel case and rose gold bezel make the Chronomat 41 gleam in the sunlight, but the face of the watch is made of scratch-resistant, glare-proof sapphire crystal that ensures the user can easily read and operate the timepiece. The Chronomat 41 has a slightly smaller 41mm case than both the Exospace B55 and the Superocean Chronograph Steelfish and a screw-down crown and case back that allow up to 300m (1000ft) of water resistance. Shop these models on AuthenticWatches.com! 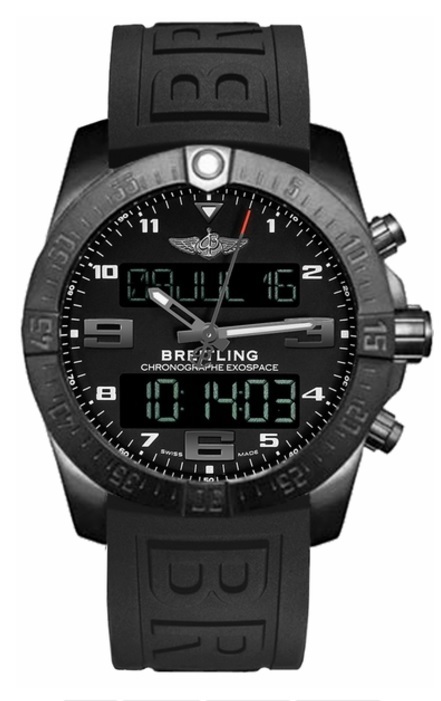 Breitling Exospace B55: Shop this model. Breitling Superocean Chronograph Steelfish: Shop this model. 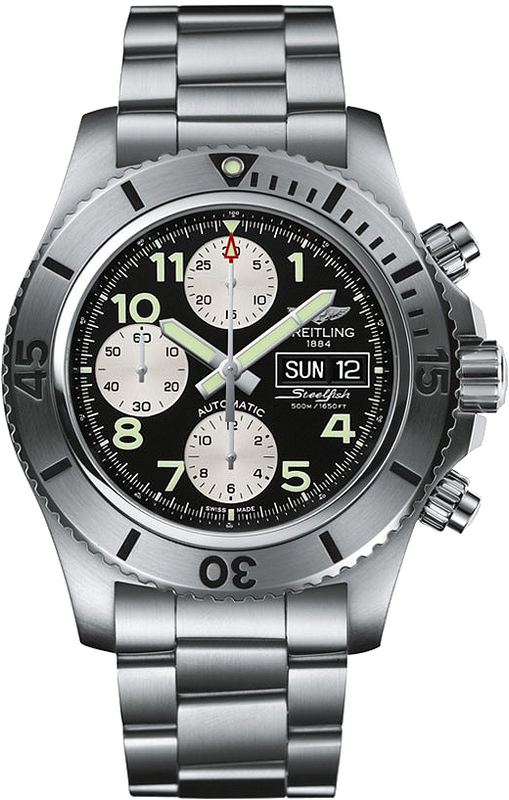 Breitling Chronomat 41: Shop this model. This entry was posted in Brand Name Watches and tagged 18k gold, 18K rose gold, 41mm, 44mm, 46mm, authentic watches, authenticewatches, b55, bluetooth, breitling, chronograph, chronomat, connected, digital display, digital watch, discount, discounts, diver watch, divers watch, diving, exospace, exospace b55, lcd display, luminescent, luxury watches, new watches, rose gold, rubber strap, smart watch, smartphone pairing, smartwatch, stainless steel, steelfish, superocean, superocean chronograph, Swiss watches, timepieces, watch collectors, watches, water resistant. Bookmark the permalink.